These DMU students, faculty and other clinicians were on hand to help road race runners. On top of mastering myriad medical/health sciences topics, taking exams, completing simulation and lab sessions, studying for national board and licensure exams and, (we hope) at least occasionally getting some sleep, DMU students do great things in the community. Faculty frequently join them in those good deeds. Two examples occurred on Nov. 17. That morning, a group of students and faculty helped staff the medical team for the 40th annual Living History Farms Off-Road Race. The race is a fundraiser for this 500-acre central Iowa outdoor attraction, which tells the 300-year story of Midwest farming. Runners, many of whom wear crazy costumes, must traverse creeks, hills, fallen trees and other obstacles along the rugged course. Those hazards make the presence of a strong medical team even more important. Homeless Community Outreach members assembled Thanksgiving meals for their homeless friends. 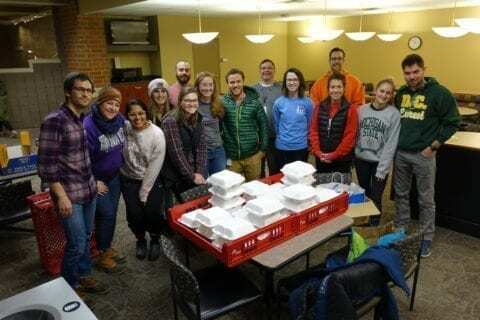 Later that afternoon, in the Student Education Center on campus, another group of students gathered as members of Des Moines University’s Homeless Community Outreach (HCO). This student organization provides friendship to individuals who are experiencing homelessness in central Iowa. Every Sunday, they visit local homeless camps to offer coffee, conversation and necessities such as socks and batteries. But on Nov. 17, they went to the next level: They assembled 30 Thanksgiving meals, which they then delivered to their homeless friends. The roast turkey was donated by HCO advisor Kevin Carnevale, M.D., associate professor of pathology; other items were supplied by HCO members and additional faculty. We’re thankful for our students, faculty and all they do to serve!